Register Log In GliderCENTRAL Forums Housing & Accessories How big of a cage for 6 suggies? I'm sitting here contemplating adopting my 6th sugar glider, but I'm wondering what size of cage you all would recommend for this size collony, as I'm thinking mine might be a little small for 6, so what size would you recommend? I have a roughly 2'D x 3'W x 5' tall for my four. I have a large wheel, 3 pouches, two waters & snack trays, lots of hammocks, & tons of room left over. Probably can handle 8 & they'd be happy, from what I've seen elsewhere on-line. It was about $120 with shipping. So that or maybe a little smaller? I would say as large as Hutch's cage or bigger. Sorry, I was apparently sucking at math yesterday when I converted from my metric tape measure (where did I put my SAE one?). The height is correct, but the other two is more like 28"D x 44"W. Not a lot of difference, but I still wanted to correct what I said. 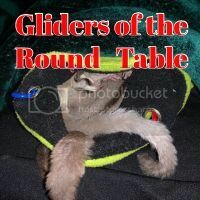 After observing my gliders for at least 4-5 years now, yes it took that long to convince myself that they're not going to play with toys the way I want them to I've reduced the number of toys. I still hang one or two extra in for my benefit (esthetics purposes), but just mainly the basic toys I've seen them utilize: wheels, a floor toy, play pit or toy box (which they don't use often) & forage toys w/pellets and occasional dried fruit. I did just get them a treadmill from SpinZone Global, placing it in there this evening so I can observe their reaction. I'm also beginning to place a braided fleece vine or two in there, because they do like climbing on those. A few fleece pieces and some wood perches/ledges complete the decor. Although I still want to change things up at times, so I do change out the few toys I do place in there, and rearrange some. But yes, I agree the size Hutch has should be good or if you can larger for 6. A lot of depends on your gliders and a bit on you how your furnish. You definitely want to have enough space for extra sleep options for them in case they want to spread out at times. Last edited by Terry; 07/07/17 02:56 PM. That is a very generous space, for 6 or more, lucky gliders! Last edited by Hutch; 07/08/17 05:21 PM.